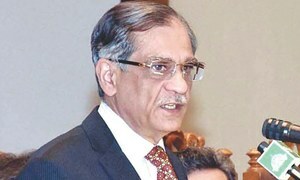 Chief Justice of Pakistan (CJP) Mian Saqib Nisar on Thursday denied that he had ordered former president Asif Zardari and his sister Faryal Talpur’s names be placed on the Exit Control List (ECL) in connection to a probe regarding suspicious transactions through 29 ‘benami’ accounts in mainstream banks. 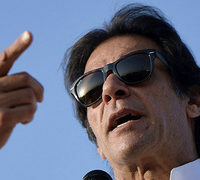 On Monday, Attorney General Khalid Javed told DawnNewsTV that the apex court had issued directives to the Interior Ministry to place Zardari and Talpur’s names on the no-fly list. 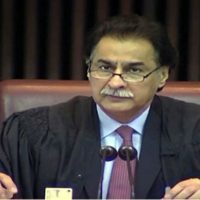 Although certain media reports quoted Interior Ministry officials as denying the development on Monday, caretaker Interior Minister Azam Khan confirmed on Wednesday ─ contrary to the CJP’s statement today ─ that the SC had directed the ministry to place Zardari and Talpur’s names on the ECL on Monday, and that the ministry had complied with the orders. CJP Nisar in today’s hearing also asked the Federal Investigation Agency to refrain from questioning both PPP leaders until after the July 25 polls. “Tomorrow no one should be able to make excuses that the elections have been rigged,” the CJP said. “If they are not suspects, then why did the media report that their names have been placed on the ECL?” he asked. The CJP said that whosoever’s names had been placed on the ECL would remain there until August 6. If someone turns out to be innocent, their names will then be removed, he added. Zardari’s lawyer, Farooq H. Naek, told the court that his client is being accused of holding Rs15 million in his accounts. He told the court that the PPP co-chairman had no ties to the Zardari Group. “He is not even the group’s director,” Naek added. Justice Ijazul Ahsan said that those who haven’t played a role in the case should not be harassed. The CJP asserted there must be a fair probe into the matter, to which Naek responded that the probe is being conducted by FIA’s Najaf Mirza, whom Zardari had earlier filed a case against. “There is already a JIT probing the matter,” Naek told the court, requesting that Najaf Mirza be withdrawn from the FIA probe into the case. Lawai’s lawyer told the court that the bank’s investment activities had been negatively affected by the ‘media campaign’. “The cases regarding the accounts did not reach me,” he told the court. The bank must provide assurance that fake accounts are not opened, Justice Ahsan said. “Fake accounts have been opened,” he asserted. National Assembly Session begins with Speaker Sardar Ayaz Sadiq in Chair.